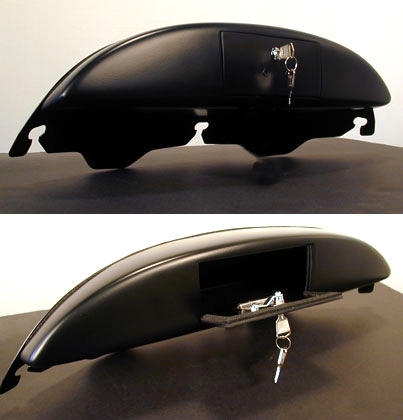 Would’nt it be great if your Batwing fairing had some storage space? 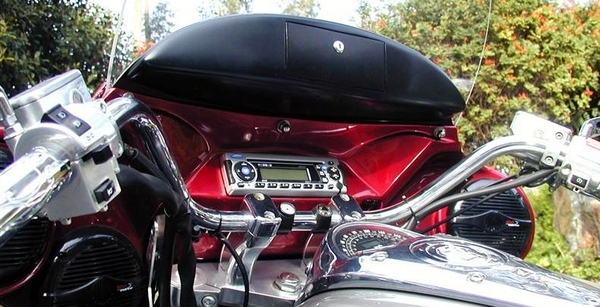 Would’nt it be great if your Batwing fairing had a good place to mount some guages, indicator lights, or switches? Well now it does! The new Bat Glove from Xtreme Parts works with any fairing that accepts a standard Harley Davidson style 3-hole windshield (96-up FLHT/FLHTC). All you do is loosen up the three bolts and then slide the BatGlove in behind the windshield. Tighten the bolts and that’s it — instant glove box! The Bat Glove has a small locking door (two keys are included) and provides a reasonably safe place to stow your sunglasses, cap, ipod, map, sunscreen, extra gloves, or whatever! The inside is lined with a soft carpet to help protect your items. The Bat Glove is also designed to be water resistant so your items won’t get soaked. The Bat Glove is easy to customize. It is large enough to mount small guages or indicators on the front. You can easily drill holes in it and then attach custom mounts for your GPS, phone, garage door opener, or whatever! You can route the wires right out the bottom of the Bat Glove and directly back into the fairing for super-sanitary installation of your gadgets. The bat glove is constructed with a sturdy aluminum backing plate black and a thick plastic housing that is easy to paint. When you paint the backing plate black it looks just like a short dark windshield – very cool.